See what you have in your bank account to the penny, instantly, in real time. Have deposits and checks reconciled by just importing a file from your bank. Reduce your risk for fraud. With positive pay, only checks on the list you output to your bank will get paid. But running spreadsheets on the side is risky way to monitor your balance. You want to base your money decisions on current, accurate numbers. Your cash is also at risk because it’s insanely easy these days for fraudsters to print checks that look like yours. Keeping an accurate tab on your cash flow is an essential part of managing your business and AccountMate’s Bank Reconciliation module makes it a breeze. 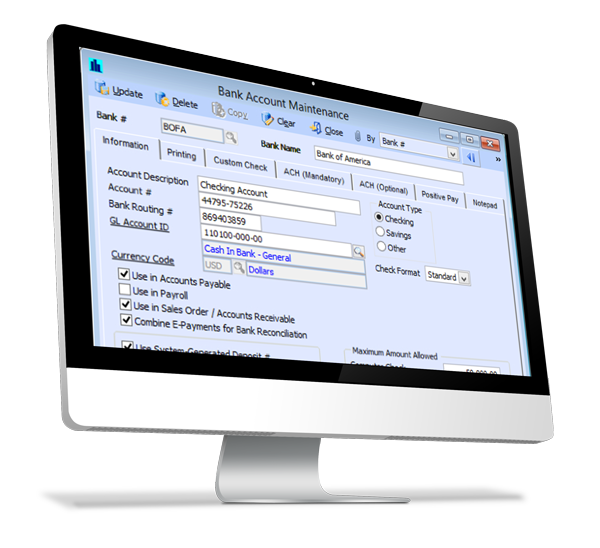 With this module, you can record miscellaneous disbursements, receipts and bank transfers that are not logged in other AccountMate modules. You can indicate which transactions have cleared the bank and reconcile your book entries with the bank statements. You can set up and update bank accounts and specify the currency in which transactions will be recorded for each one. You can quickly view your current bank account balance, the last reconciled bank statement balance and the total amount of unreconciled bank transactions. Watch your money like a hawk, automatically with your AccountMate.